박신용 장군(1575~1627)은 광해군 10년(1618)에 무과에 급제하고 선전관을 거쳐 권지중군이 되었으며, 정묘호란때 후금의 군사와 싸우다가 죽음을 당하였다. 고종22년(1885)에 유의각(遺衣閣)을 세우고 이 유물들을 봉안하였다고 한다. 1874년 민병승(閔丙承)이 찬한 신도비명(神道碑銘)이나 1896년 이설(李崔)의 유의각비문(遺衣閣碑文)에 의하면, 당시에 시신을 찾지 못하여 집에 있던 박신용 장군의 유의와 신발은 허묘(虛墓)를 만들어 매장하였으며, 그 후 숙종 11년(1685)에 병조참지(兵曹參知)를 증직(贈職)받고 영조 27년(1751)에 정려(旌閭)되었다고 적혀 있다. 유물로는 관복1점, 청철릭, 홍철릭 각1점과 전복으로 입었던 답호와 허리에 매던 대 3점이 남아있다. 관복은 깃모양이 둥근 단령이며 소매가 넓은 홑겹의 모시로 만든 옷으로 길이는 134㎝이다. 아쉽게 가슴과 등뒤에 수놓인 흉배가 없는 것이 흠이다. 청철릭은 푸른색의 철릭으로 철릭이란 조선시대 문무관리들이 외국사신으로 파견될 때나 국난을 당했을 때 임금을 호종할 때 착용하던 옷이다. 이것은 푸른색 명주로 만들었고 품이 32㎝, 치마길이는 94㎝이다. 홍철릭은 청철릭과 비슷한 크기와 모습을 하고 있으나 붉은색 명주로 만들어 졌다. 전복은 평상복위에 걸쳤던 것으로 소매가 없고 덧 대는 천인 무와 섶이 없는 옷이다. 겉은 보라색이고 속과 동정은 흰색으로 되어 있으며 아래가 퍼진 모양이다. General Bak Sin-yong (1575~1627) passed the military service examination in 1618, the tenth year of King Gwanghaegun’s reign, and served as Seonjeongwan and Gwonjijunggun. He died during the war against the Latter Jin invaders in 1627. His artifacts were preserved in Yuuigak Shrine in the 22nd year of King Gojong’s reign (1885). According to the Sindo Monument praised by civil official Min Byeong-seong in 1874 or Yuuigak Shrine of civil official Yi Seol in 1896, the body of the general was not found, so his clothes and shoes were buried in an empty grave; later, the official position of Byeongjochamji was given posthumously to him in the 11th year of King Sukjong’s reign (1685), and jeongryeo (memorial gate), in the 27th year of King Yeongjo’s reign (1751). 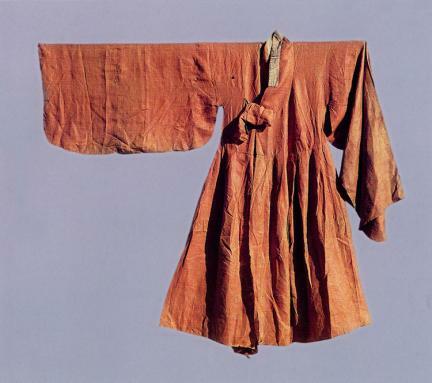 The style of the clothes excavated from the grave shows that they were probably buried posthumously in his grave by the descendants of the general in the process of King Sukjong’s offering of government position and King Yeongjo’s offering of memorial gate. The style of dallyeong (ceremonial robe), cheollik (official robe), and gwaeja (sleeveless topcoat) suggests that they have been made during the period when the general lived but shows the characteristics of the 18th and 19th centuries or 100 years or 200 years later than his lifetime. The relics excavated from the grave include one official uniform, blue cheollik, red cheollik, a piece of dapho (sleeveless official uniform), and three pieces of dae (belt), which was used to tie the waist. The official uniform is dallyeong (ceremonial robe) with round collar and wide sleeves. It is made with ramie cloth and is 134 cm long. Unfortunately, the hyungbae (embroidered insignia) on the chest and back of the official robe is missing. The blue cheollik was worn when civic and military officials were sent to a foreign country as envoys or when they escorted the King or during times of national crisis. It is made of blue silk and is 32 cm wide and 94 cm long. The red cheollik is made of red silk, with size and style similar to the blue cheollik. Jeonbok was worn over the ordinary dress, and it has no sleeves and collar. The outer side is purple, whereas the lining and collar strips are white. The lower hem of the clothes has a spread-out style.